It's Not a Comp, It's a Sale; Stop Fannie Mae Lies! Something’s been gnawing at my craw ever since January when FNMA’s wonderful Collateral Underwriter (CU) was unleashed to the world. And before that, when FNMA’s Appraiser Quality Monitoring (AQM) process was introduced to judge the work of appraisers. No one else has written about this. No one has even mentioned it. So I will: It has to do with the word “Comp” which is used liberally by Fannie Mae (FNMA). A true “Comp” is a property viewed and/or analyzed by a real living, breathing, mirror fogging appraiser. An appraiser who compares sold property against the subject property in terms of multiple features, characteristics and amenities. It is not determined by an AVM. It is not determined by an algorithm within the vast bowels of FNMA. Until the property has such analysis done by an appraiser, it is merely a SALE…it is not a “Comp”. said Breck Tyler, Executive Vice President, Trustmark Mortgage Services. I’m also asking members of appraisal organizations and associations to communicate your concern about this lie perpetrated by FNMA directly with them. Ask FNMA to change the word “Comp” used in their CU Reports, news releases, instructional materials, etc. to “Property Sales” so that there is no misunderstanding about the significance of this issue. I agree 100%. You know nothing will be done though. Dave Towne-Excellent article, and very valid point. We have arrived at a point where our trade jargon has become commonly used by people that do not know the difference between a comparable sale, and a recorded transaction being reported as a sale. Even refinance transactions are often reported as closed “sales” which in turn are mistakenly referred to as “comps”. This happens most often when a grant deed correction to clear up vesting is used rather than a quit claim. ALL of us need to make an effort to relegate the term “comp” to the trash heap, as a misleading colloquialism. One that has also outlived it’s useful life. I am forwarding a link to Dave’s article to The American Guild of Appraisers (AGA); along with a request that ‘we’ adopt Dave’s suggestion immediately; and encourage our members to do likewise.. THANK YOU!! I’ve been arguing this and so frustrated that my time is taken up by these ridiculous revision requests answering why the “sales” submitted by the CU system are not comps. Reviewer doesnt’ argue with me when I tell them that the CU submission of (3) 2 bedroom sales sold months ago are not as good as the very recent sales of (3) 3 bedroom COMPS (subject is 3-bedroom) that I have in my report. This just because some computer kicks it out as over valued!! This is a stupid waste of everyone’s time. I’m insulted by it! We all should be! FNMA and the Geeks have done the industry a big disservice. Koma- I say this with all the respect due to a fellow appraiser. It is the “nothing will happen” or “We cant do anything about it” attitudes that are responsible for “nothing happening” (which btw is incorrect. The American Guild of Appraisers (AGA) is doing a LOT. I know because I personally review the blacklisting and unfairly referred to state for disciplinary action complaints. We have (successfully) offered suggested discussion points for those threatened with blacklisting where the lender ‘reconsidered’ their position and reinstated the appraiser. We have written to State Governor’s and Labor Relation Officials over the seemingly excessive over reactions of their enforcement divisions. We also know that in some cases our members MAY have been remiss and corrective action is necessary. In such cases (where ethics are not the issue) we seek to encourage reeducation rather than crushing monetary fines and penalties. Numerous State Coalitions of Appraisers have also made headway in recent months. North Carolina’s is very active. Virginia’s recently got favorable reasonable and customary legislation passed. Even our partners from the E&O and title insurance segments in the Appraiser Prosperity Coalition seek alliance with appraisers to promote common interests. Just to clarify I said nothing will be done. You have posted a lot of paragraphs to show what is happening, but out of all that typing you have not pointed at what has been done. “Successfully offered suggestions” or “Reasonable and Customary Fee” are just some of the smoke and mirrors attempts to keep appraisers quiet. Freddie and Fannie are like Walmart, the 800 lb gorilla in the room, with the money and influence (lobbyist) they have they’re running and will keep running the game. You mention unions. Do you really want to go there? Article out of Philly: The head of a Philadelphia ironworkers union will face a jury alone next month, after three more of his brothers in labor agreed to last-minute plea deals Tuesday, admitting they maintained their local’s grip on area construction through violence and sabotage. Unions are still my grandpa’s old union! Anyway if your republican brethren have their way and the Koch brothers buy the election and insert Scott Flipping Walker as president unions will have no power at all. How many hardworking people like myself will be willing to give their money to someone with no power/influence. NONE! Mike- I say this with all the respect due to a fellow appraiser. You sound more like a politician than an appraiser and you know how American’s feels about politicians. You do what you got to do and I’ll do what I got to do. I enjoy appraising and will retire from appraising. But I will not be pushed around by anyone. If they want to get rid of me I have a previous career (25 yrs) to fall back on. With only 600 +/- active appraisers in my home state with a population of 1.9 million they better pray more appraisers like myself do not leave. The day they transition away from us is the day the 2008 crash will look like a bump in the economy. For what it’s worth I’m a center right Republican traditionally am vehemently opposed to unions. I was IN the steelworkers union in 1983 and we priced ourselves right out of business!. I was also a member of the Treasury Departments National Treasury Employees Union (NTEU) in the mistaken belief it was something other than a rubber stamp for IRS management level policies. It remains a huge disappointment. I’m not naïve enough to believe unions OR their leadership are at all pure. What I DO know about AGA is that every one of us is volunteering our time. Our President, National Membership Coordinator and myself; as well as other members across the country. Our union “parents” have waived up line fee contributions from us for the year. THEY know the old style unions are declining too. They are counting on our model to bring them back to their core roots once again, in a modern, and socially acceptable manner- NOT like the traditional violence prone strikes and narrow minded job actions of the past. Are they all on board? Heck no! Maybe AGA will one day be large and corrupt like some of the others. If that ever happens, I will then oppose it. I can’t control the future, though I can try to influence it. My background is at http://mfford.com. NOTE: for three years I was the only source posting online data for internal IRS DLOM information. I did so knowing they may be ‘peeved’ at my posting their internal (non-classified) but ‘sensitive’ information. If you check now for DLOM now, you will find IRS became embarrassed at having nationally renowned CPAs referring to an ex-employees site for discount information they should have made available years before. I’m not afraid of a fight. I sided WITH a railroad against “environmental” extortionists in my own neighborhood.-Yes it was a team effort. It was perhaps one of the best orchestrated lobbying campaigns I’ve ever seen first-hand (by the railroad). It also opened my mind up toward unions when I found them, AND big business working together for a common cause. This isn’t my first rodeo in fighting for citizens’ rights against big powers. You should be joining us-not remaining on the sidelines merely as a naysayer. 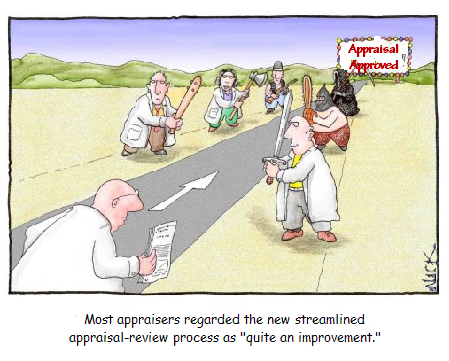 Found a great appraisal cartoon online the other day. You’re going to love this one. Credit to whomever made it, and linked from their website. Good one.